Education is the right of every man and woman. Being an Islamic State, Pakistan is supposed to give a lot of importance to education as the religion Islam has put great emphasis on education. Unfortunately, this is not the case. The subcontinent, once upon a time, used to be the core of quality education. Students from all over the world used to come to the region to seek knowledge. Look at the state of affairs of Pakistan now. Even after independence, the overall predicament has not changed. The education system still showcases the effects of slavery. Lifeless and academic. It bears no imprint of freedom. The universities in the country proceed along the same courses that were set by the British years ago. The education offered is passive and mechanic. The state of education in this country is very weak. Most of the government institutes are in poor conditions and the government does not seem to be taking any radical steps for its improvement. There is a lack of trained staff and literate individuals. The people who are well educated are offered such low salaries that they opt for working in private educational institutions rather than government ones. The whole education sector is poorly managed by the government and due to these pathetic standards the rich choose to send their children to private schools. This creates an educational gap between the rich and the poor. The poor cannot afford to go to private educational institutions and so are deprived from obtaining quality education. The students from government schools are unable to compete with those of private schools. Another problem is the regional disparity. The schools in Baluchistan are not in the same league as the ones in Punjab. Educational institutions in Punjab and Sindh are more groomed. In FATA, the situation is even worse. Madarsas are educational institutions which do not charge their students a dime. Along with education, they provide accommodation and food. The poor choose to send their children to these institutions due to obvious reasons. Language is another barrier. 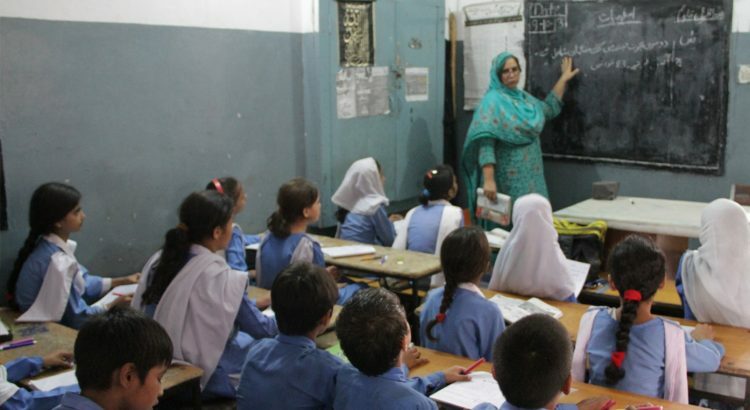 Most private schools choose English as their medium of education while the government institutions prefer Urdu .Some students study in Urdu all their lives and then when they go to colleges and universities, they have to study in English. It becomes rather difficult for them to adjust to the change in language. The youth is divided into different classes and this affects the uniformity of the students. This lack of uniformity in turn results in intellectual differences amongst the youth. The nation drastically suffers due to the dual education system that prevails in our country. There are major loop holes in our education system. The documents are filled with name of Ghost teachers and ghost schools. The institutions are getting payments and funds, however in reality they do not seem to exist. Most of the buildings of public schools are taken over by Waders and are used as marriage halls and bethaks etc. For a Pakistani student, it is a lifelong struggle. The weak and dual system of education does not only affect the student’s way of thinking but also limits their work performance. They are unable to secure good jobs. Most employers prefer employees who have gone to better private schools and received quality education. Pakistan needs to improve its education system if it wants to prosper. The youth is the future of every country and with such little uniformity among students, the nation cannot develop peacefully.